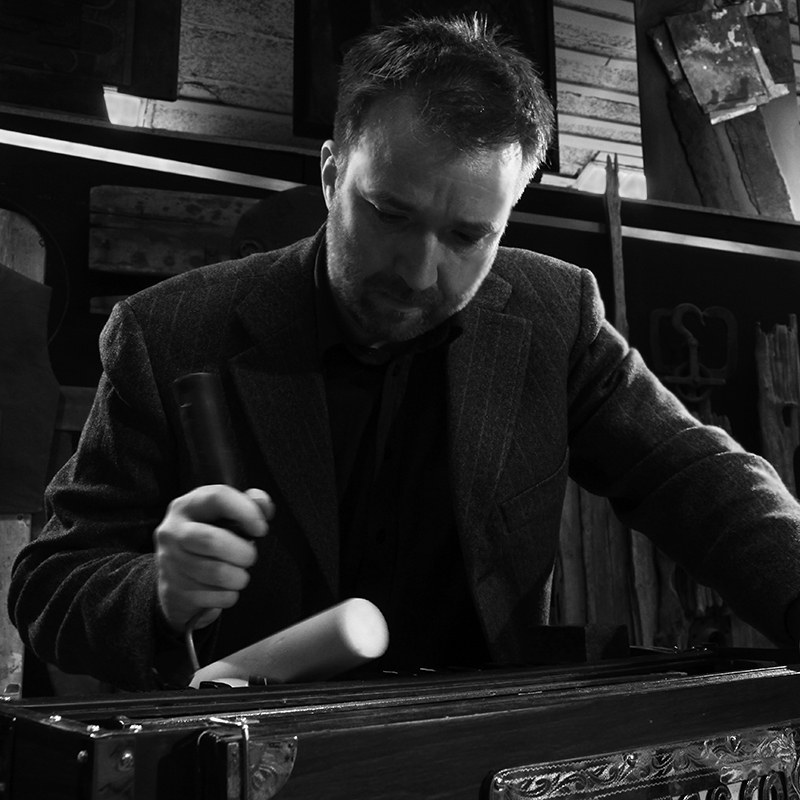 Kriton Beyer (* 1968) is a Greek-German musician and composer, who – as a performer and improviser – mainly works with the harmonium. He studied musicology at the Aristotle University of Thessaloniki in Greece. From 1990 – 2004 he played with a variety of local music groups in Greece, the better known of which probably being Sakis Papadimitriou’s troupe “omada epi topou” (“the offhand ensemble”) and the post-rock group “Sigmatropic”. In 2004 he moved to Berlin, where he got heavily involved in the improvised music scene of the city. Since then he has worked with many musicians like: Kresten Osgood, Axel Dörner, Tristan Honsinger, Tomomi Adachi, Richard Scott, Liz Allbee, Floros Floridis, Els Vandeweyer and Harri Sjöström. Kriton Beyer is also a member of the electroacoustic trio “uproot” and the “Berlin Soundpainting Orchestra”. As a performer, he uses both the natural sound of his instrument and regular playing techniques as well as preparation, objects and extended techniques. As an improvising musician he has performed throughout Europe. His compositions are usually characterized by conceptualism, while some of his more recent work focuses on pattern formation of sonic events in time continua. Kriton Beyer has also conceived and commissioned the music software CinePrompt®, which was specially developed for the use for live musical performance and live recording to films.